At first glance, Razer’s Orbweaver gamepad can look quite daunting: 20 mechanical keys and an eight-direction thumbstick, which itself has another button and a thumb lever, all attached to a two-piece wrist and palm rest. The whole thing looks like it belongs in an airplane cockpit, and not attached to a gaming rig. Despite this, once you actually get down to using the Orbweaver, we found it to be pleasingly comfortable and straightforward. 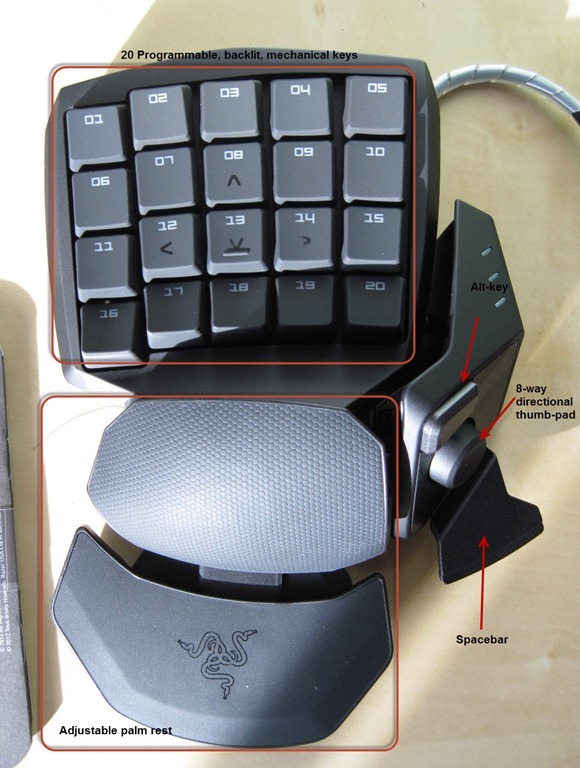 The Orbweaver is ready to go, straight out of the box, with its keys configured to mirror the left side of your keyboard - WASD is configured to buttons 8, 12, 13, and 14 respectively (as denoted by the arrows). The keys themselves use cherry MX Blue switches (the same type found in Razer’s BlackWidow mechanical keyboard), and have a fairly short travel distance, with minimal actuation force required (just 50g of force to be precise), and a nice tactile bump. The backlit keys help for late night gaming sessions and, although you can’t customize the green color, you can set it to pulse lighting mode, or turn it off altogether. Strangely enough, the cable is the regular plastic type, not the usual high-end braided variety found on most of Razer’s other products. As mentioned, the Orbweaver is very comfortable to use, with both the wrist rest length and palm rest angle adjustable to suit your hand. The thumbstick module can also be adjusted. The Orbweaver is much more comfortable compared to most keyboards, especially over long gaming sessions, as keyboards rarely have sufficient (or any) support, which can lead to wrist strain. By default, the Orbweaver’s thumbstick mirrors the arrow keys on your keyboard, while the thumb lever functions as the spacebar. This lets you use the thumbstick to control your character, and the thumb lever to jump, although, unless you have a huge thumb, it can be a bit tricky to do both at the same time. One minor quirk is that ‘Up’ on the thumbstick is actually positioned about 45 degrees off to the right, as indicated by a small arrow. This makes sense based on the direction your thumb will be pointing in with your hand on the device, but is not immediately intuitive to use. 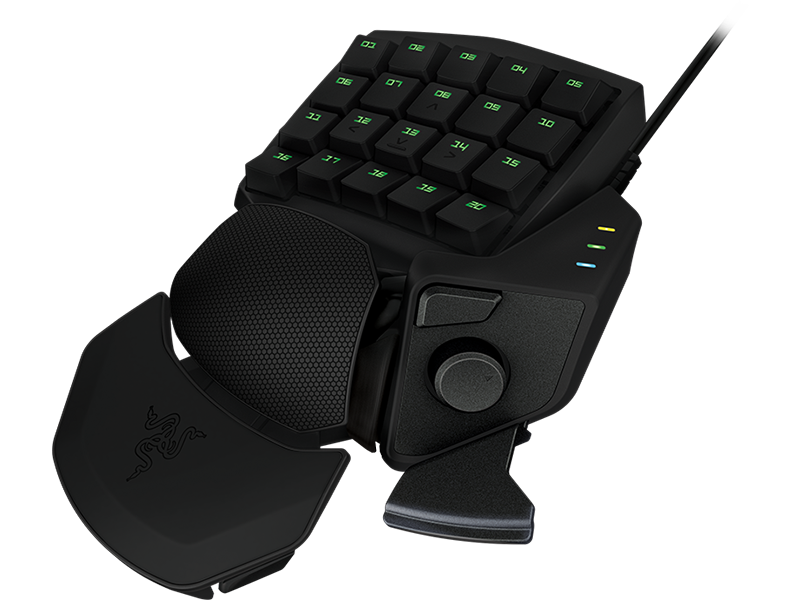 While the Orbweaver does work straight out of the box, you will get more mileage out it by using it with Razer’s Synapse 2.0 software. Synapse 2.0 allows you to easily configure the Orbweaver’s buttons by remapping and customizing them. 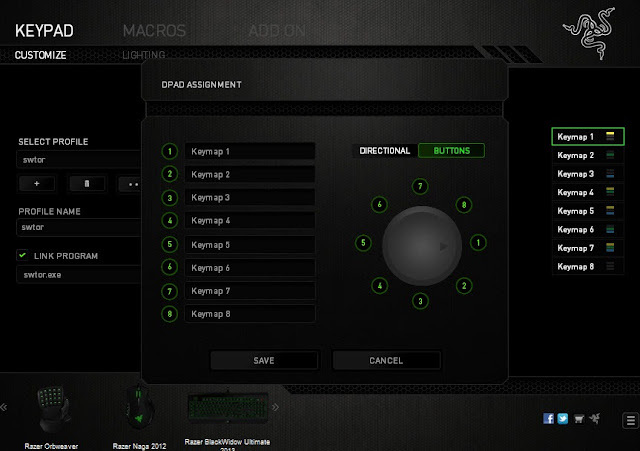 It also gives you full macro capabilities, which can then be bound to any key. All twenty keys on the Orbweaver are easily within reach and we actually found that the thumbstick buttons and lever worked better as Shift, Alt and control modifiers rather than movement controls. 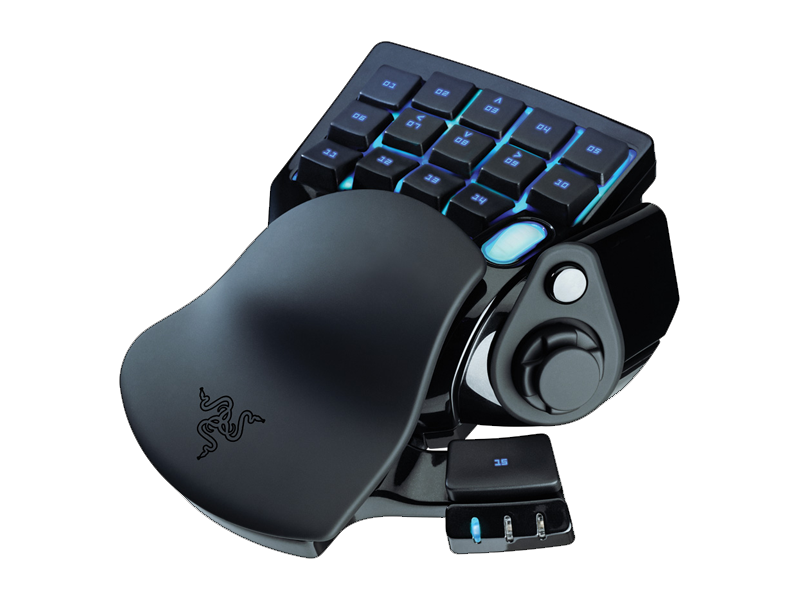 Using them as such gives you easy access to 60 keybinds – more than enough to satisfy even the most diehard of MMO gamers. 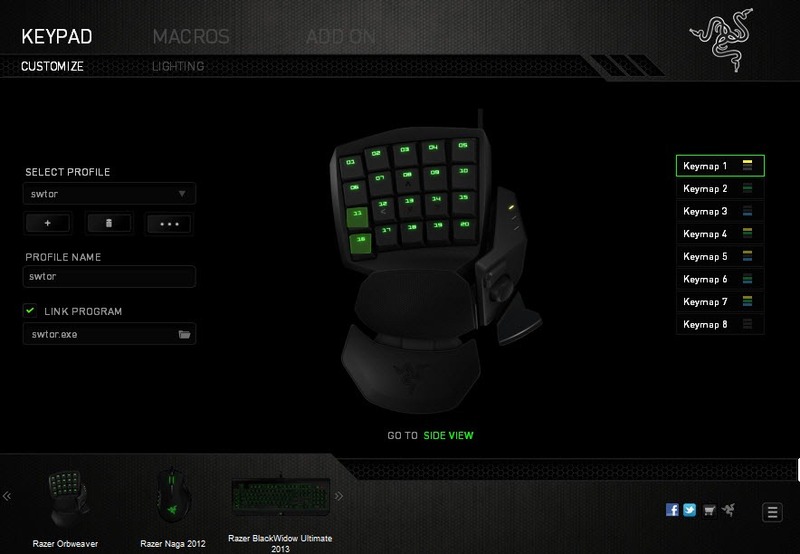 Fans of Razer’s previous gamepad, the nostromo, will likely be interested in the Orbweaver. However, we did not feel that it was that much of a leap forward. MMO gamers will probably find the most usage here, as its very comfortable to use for hours on end and provides easy access to a huge numbers of keybinds. Other gamers looking for more macro buttons, or anyone suffering from a lack of wrist support on their keyboard could also be well served by it. All in all, the Orbweaver is a nice, well-built tool, but at $199.90, which is more expensive than most keyboards for what, you might argue, is only half a keyboard, it’s certainly not for everyone. Keys - 20 keys, 8-directional thumbstick, thumb button, thumb lever.